"Warwickshire’s ‘Sudeley Castle’: Griff Manor House Revisited"
I first came across ‘Sudeley Castle’ during my role as an inquisitive schoolboy in the early 1970s. It was on a cloth-backed Ordnance Survey map inside the Lord Mayor’s desk in Bedworth Council Chambers. A carefully crayoned red band marked the route of a bypass; it led to a circle – a proposed traffic island at Griff, Nuneaton - beneath which one could still make out the name of the site. Local tradition maintains that the ‘castle’ still lies buried under the traffic island, now the junction of the A444 and A4113. In reality, the eastern third of the site was consumed by the road works in 1974, and the rest was removed to get at coal in 1986. It is now relegated to the living memory of a dwindling few, a hard-to-find technical paper and a glass cabinet in Nuneaton’s museum. The ‘castle’ appellation goes back perhaps no more than two or three centuries, for the site was known in antiquity as Griff Manor House, a central place of the parish of Chilvers Coton from the late 12th century until the late 14th century. The site was part-excavated by archaeologists in the summer of 1966, an investigation prompted by a double threat, not just the bypass, but plans were afoot for an open-cast mine in the fields between Griff and Bermuda Village (see Bull. 462; Bull. 463). 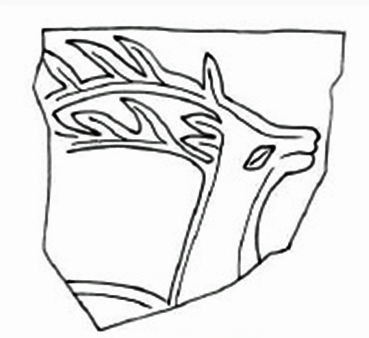 I revisited the site archive during a recent reassessment of the renowned Chilvers Coton medieval pottery industry, and creation of an archaeological GIS (geographic information system) of the parish. As frequently seems to be the case, there was nothing other than artefacts. The photographs above (see ‘Viewpoints’ on main building plan) are therefore particularly unique; they were taken by the late Ted Veasey, a local historian and history tutor at North Warwickshire College. 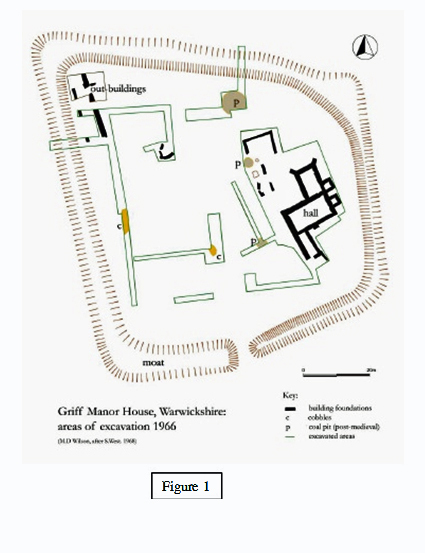 The report typescript shows that the site history was generously researched and written by Eileen Gooder, and though not styled as a main contributor she was clearly a godsend for archaeologists excavating Warwickshire’s medieval sites at that time. The site had belonged to a distinguished Saxon-Norman family whose seat was at Sudeley in Gloucestershire. Harold de Ewyas de Sudeley may have been the first in residence at Griff, at least some of the time, for in 1086, William I’s surveyors named him as holding his father’s manor of Celverdestoche (Chilvers Coton). Harold was born around 1050,son of Count Ralph "the Timid", Earl of Hereford. His grandparents were Count Dreux of Amiens and Vexin and Princess Godgifu (or Goda) of England, sister of Edward the Confessor. After Dreux ’s death in 1035, Godgifu remarried one of William’s right hand men, Eustace of Boulogne (who was to fight at Hastings), a marriage which sealed the alliance of this Saxon-Norman family. The land of Celverdestoche was in the Coleshille Hundred on the northern tip of the Arden. In Saxon times there were two manors – Griff and Coton, though these ormed a single lordship by the time of the conquest. In Harold’s day, much of the land was wooded. The two focal points of the manor were the vills of Griff and Coton, the latter where a church of some description is thought to have already been founded. Sir William Dugdale deducted that this was Saxon Ceolfrith, the place where someone by the name of Ceolfreda had some cottages (Coton), possibly below the ridge which marks the edge of the outcrop of the Warwickshire coal field, beyond which to the north is the Trent Valley. Celverdestoche does not easily roll off the tongue; the English Place Name Society believed it to be a Norman corruption, but did not rule out the possibility that the second element of the word could mean stoc, a place marked by tree stumps, in other words, a woodland clearing. Either way, a picture is beginning to emerge. Numerous irregular-shaped enclosures or assarts survived down to the 1970s, denoting unplanned and piecemeal clearing of trees to make fields. The cultivable land amounted to seven hides, a hide being the amount of land which could support a family for a year, although this depended on how large was the family. Beneath Harold, and excepting any members of the clergy, there was a three-tiered community, 15 villani, 7 bordarii and 7servi. The figures represent the male heads of families, though may also represent the able-bodied adult men. The villani were noteworthy farmers and villagers whose distinction was that they were freemen, who held owned land of their lord, which usually amounted to between half a hide and a hide. Below them were the ‘unfree’. The bordarii, with no security of tenure, performed labour services to their lord in return for a miserable existence, and were frequently found living in hovels and huts on the borders of the heaths, wastes and commons. Below them were the servii, or slaves, who were really items of property, belonging to, and labouring for a master. There were seven ploughs listed at Domesday, which we may also interpret as seven teams of eight oxen. It would be sufficient for the given hideage but clearly well below the arable capacity of the manor which was estimated to be enough for ten ploughs. It is not possible to say how the seven hides were divided amongst the community, or indeed how the inhabitants were divided between Griff and Coton. Population figures can only be at best a guesstimate. The hideage suggests land to support 7 families, but based on just a third of these men representing a household of between 3 and 6 persons we might think in the region of 45 people. At the time of the survey the whole lot, people rents and land was worth 50 shillings – an increase of 25 per cent since the conquest. The balance of woodland to cleared or cultivated land at Celverdestoche may also be deduced. Woodlands accounted for an area measuring 1 league lengthwise by half a league in width, although directions are not stated. The league was sometimes calculated as three thousand steps, or 12 furlongs, bearing in mind that one must allow for ‘rule of thumb’, variability of customary measurements, the length of the measurer’s stride and how this could be maintained up and down hill, through field and woods. Effectively, it took an hour to walk one way through the woods and an hour and a half to walkthe other way, which based upon an ancient league being equivalent to 2.275km would be not dissimilar to the area encompassed by both Chilvers Coton Woodlands and Arbury Estate (i.e the west half of the parish) in the 17th century. The tentative conclusion would be that the assartswere largely an early feature of the parish, dating back to the pre-conquest period (i.e. 9th - 10th centuries). Meadowland or grazing lands amounted to 3 leagues 40 roods long by 1 league wide, but the calculations seem to be overly generous, for this would take us well beyond the bounds of the parish. 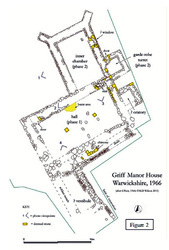 Place names and field names tell us that there were some fairly substantial ancient structures or settlements in the manor, which may have been pre-Saxon, or non-Saxon in origin. The name Arbury itself derives from the Old English for ‘the old earthwork’, - the old bury – the earliest written forms being Orbiri (c1150s), Orbiria (c.1170), and Orbury (c.1225). Local dialect undoubtedly transformed this in time to Erdebyre and Erbury (c.1250s). Just to the east of Arbury house, a Roman roof tile kiln was discovered and excavated by amateur archaeologist Keith Scott in 1970, allowing us to infer that one ‘earthwork’ may have concealed an abandoned Roman building, for it is doubtful that heavy tegulae was transported very far. In the 17th century two ancient defensive structures are referred to. One of these, "the Danes’ camp", "where there are certain trenches", was situated somewhere at Hilltop and appears to have been either visible as an earthwork or within living memory. The site may equate to an area where pottery, either Iron Age or Saxon, was found in a ploughed field near Red Deeps School. The other site was ‘The Beristeads’, a small irregular-shaped field to the southwest of Griff Hollows, the first element of the name being a derivative of bury, implying a fortified ancient enclosure, or possibly even the site of a forgotten manor house. In the late 12th century, Harold’s grandson Ralph began to reshape the Chilvers Coton landscape, by first giving away a third of his manor to the Austin priors where they began to build Erdbury Priory, and then donating another third to the Order of the Knights Templars. Such huge acts of piety chimed with a trend throughout England following the example of Henry I; Ralph’s own monarch Henry II surpassed all of his predecessors with his generosity to the Templars’ cause. 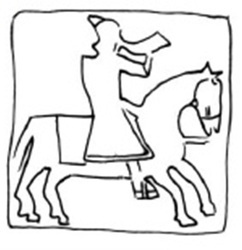 Ralph rented back the land from the Templars for his own use at a charge of 6½ marks a year, which he did until his death in 1191. Ralph’s soul was indeed to be a healthy one. It is uncertain who began the construction of Griff Manor House. 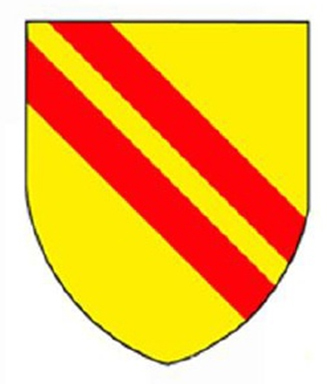 Ralph had two sons, Optuel, his eldest and heir, and Ralph. It is quite possible that the manor of Griff and Coton was intended for Ralph. When Optuel died in 1198, Ralph became sole heir to the Sudeley estates. 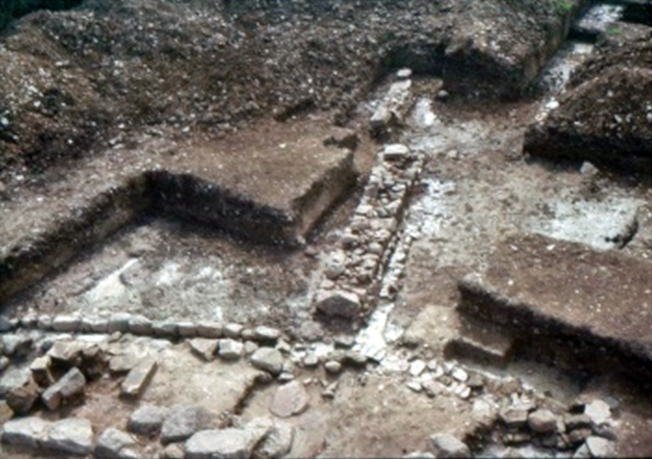 The findings of Stanley West’s excavation were impressive, but not wholly what was expected. The main feature uncovered comprised substantial stone footings of a "highly finished" stone building, c.15 x 9m, situated within the east side of the enclosure, considered to be "at very earliest, a twelfth-century, more probably later thirteenth century date". As a manor house it was a little on the unusual side, having all the appearance of "a specialised type of house", like a hunting lodge. Unlike the usual ground-floor hall of a lord, this building was originally designed to have a first floor. This was indicated by two stylobates of dressed stone, upon which timber posts would support a heavy longitudinal beam carrying the floor-joists. The documentary evidence tells of a private chapel to celebrate divine worship (c.1230s-1240s) although it is difficult to say with any certainty where it was located. A small cell (c.3.5 x 2.7m) adjoined the east end of the hall (Viewpoint 2), which was thought to have been an oratory, though more mundanely, may have been a garde-robe. The hall was entered from a rectangular vestibule, approximately 9 x 5m, attached to the south side (Viewpoint 4) which probably had the stair to the upper floor. There were two distinct phases. 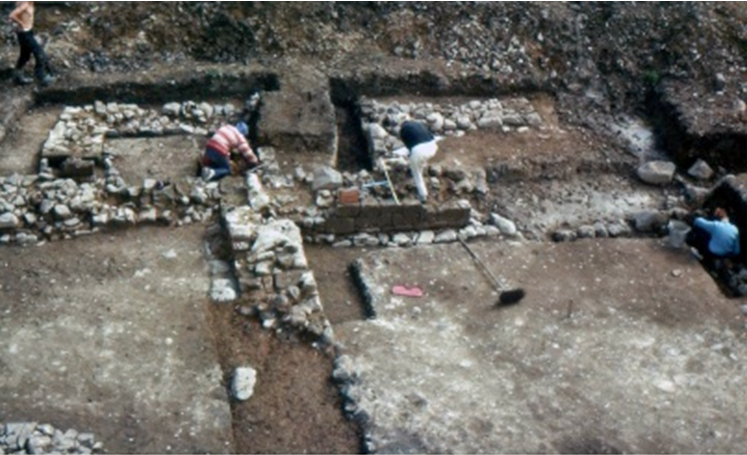 Projecting at a right angle from the northeast side of the hall was an inner chamber, c.9 x 7.1m, with the remains of a window embrasure in its east wall and diagonal buttresses at its north end (Viewpoints 1 to 3). A small garde-robe turret, c.3.9 x 3.8m,projected from the east wall (Viewpoint 2). Although the entire building had been systematically robbed, there was sufficient to gain an impression of its superstructure. A few courses of dressed ashlar survived in situ (Viewpoint 2), in some places with traces of plaster, and from the rubble came a single fragment of window tracery and pieces of octagonal chimneys. The buildings were roofed in diamond-shaped slate (local Stockingford Shale), crested by green and brown glazed ceramic ridge tiles with looped finials. The floors, also robbed out, are thought to have been laid with encaustic tiles, based on a handful of fragments found in the rubble. Interestingly, two of these tiles have a hunting theme, one a mounted huntsman carrying a horn, the other, a fragment, being a deer. A third piece, with a deer design, was posted to me a few years ago by a local amateur archaeologist, Ron Waite, who had recovered it from the spoil after the dig. Not only are the designs of these tiles unusual, but they may have been made-to-order (at Chilvers Coton), locally, to suit the character and function of the house. So, perhaps not merely a stopover for the Gloucestershire lord when presiding over annual manorial courts and tending to the accounts of his estate, but a seasonal retreat where he and his peers could be entertained with ‘the chase’. 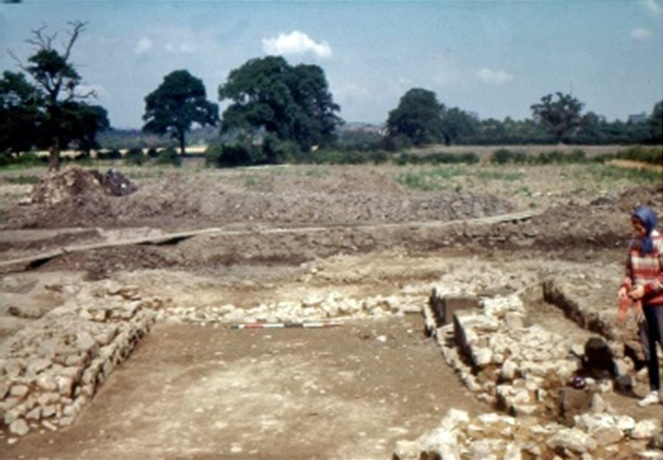 About 10m to the northwest of the stone building, but detached from it, were the plough-damaged remains of another structure with trench-built stone foundations. It was roughly square in plan, 7.6meast-west by 6.7m north-south, but the remains were too impoverished to produce a proper floor plan. Neither could its date be ascertained. Traces of other buildings, again plough-damaged, were found in the northwest angle of the moat enclosure, and fragments of cobbled surfaces were exposed elsewhere in trenches. Moats were at that time in fashion. The awkward trapezoidal shape of the moat at Griff might suggest that it was dug around an existing site. It was fed from a nearby spring, via a feeder channel. The two sections cut across it proved it to be about 22ft in width, but quite shallow - between 1m and 2m.Nothing defensive was intended, its main purpose being to reinforce social order between a lord and his vassals. When it came to chronology, historian and archaeologist were at odds. 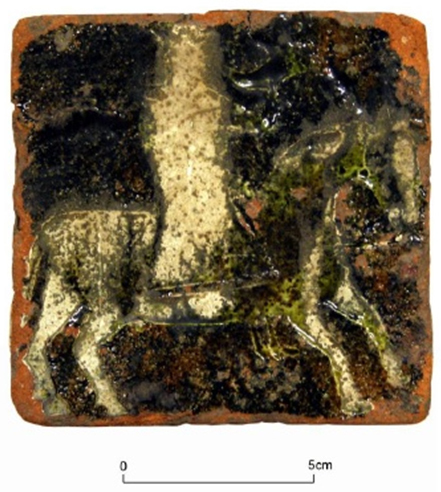 The documentary evidence for the manor house pointed to at least the late 12th century, whilst the pottery - from which the site was dated - was understood to be no earlier than about AD1280 to 1300. It appears that there was no pottery at all from sealed deposits. There were no middens and no waste pits found, but one might expect these to be at a reasonable distance from the main building; perhaps even beyond the moat enclosure. We should also bear in mind that the site was never fully explored – at least 75% was left buried under the turf. Of the moat itself, just over 1% of the moat was investigated. Even so, now with the benefit of more medieval sites excavated in north Warwickshire, we are probably able to push back some of the pottery dates into the early 13th century, perhaps even 12th century. 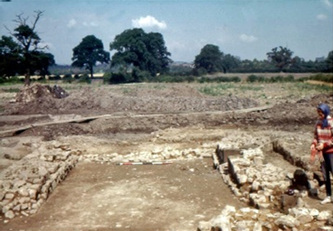 The western two-thirds of the moat enclosure continued to be ploughed until 1986 when it was finally mined away. 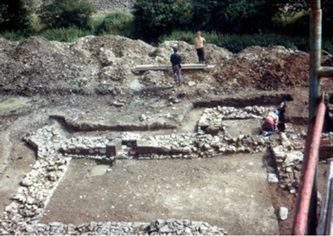 Although a ‘watching brief’ was held during the works, nothing could be seen in the way of archaeological features. But this hardly comes as a surprise when one considers the overburden Stanley West’s team had to dig through - any archaeologist would be hard pushed to identify ephemeral traces of robber trenches and post-holes in such circumstances. Had the mine been delayed another four years later (i.e. with the advent of PPG16) it may have been a different story. West, S.E. 1968. 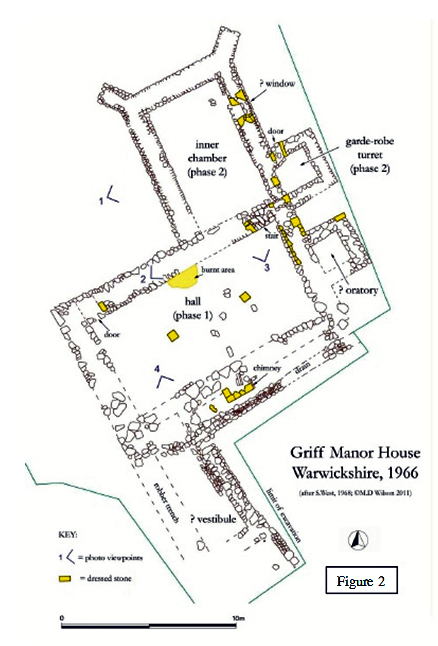 ‘Griff Manor House (Sudeley Castle), Warwickshire’, J. Brit Archaeological Association, 3 series, vo.31, 76-101. It is possible however, that some woodland clearance took place in the 11th or 12th centuries. Although West stated this was limestone, it may have been sandstone. The Carboniferous Halesowen Sandstone, which is near copycat in appearance (pers. comm. Alan F. Cook), was also used on the nearby Templars’ manor house. A central strip was reported to have survived the mine (c.f. Warwickshire SMR 5140-WA514, note 7), but doubtfully survived the 1990s industrial estate which now occupies the site. Except where stated, all content and imagery above (c) Martin Wilson 2011, taken from the Coventry and District Archaeological Bulletin, No 464, January/February 2012.